See how binary searching works on your Java arrays and consider the approaches of implementing those searches both iteratively and recursively. This week’s task is to implement binary search in Java, you need to write both iterative and recursive binary search algorithm. In computer science, a binary search, or half-interval search, is a divide and conquer algorithm that locates the position of an item in a sorted array. Binary searching works by comparing an input value to the middle element of the array. The comparison determines whether the element equals the input, is less than the input, or is greater than the input. When the element being compared equals the input, the search stops and typically returns the position of the element. If the element is not equal to the input, then a comparison is made to determine whether the input is less than or greater than the element. Depending on which it is, the algorithm then starts over, but only searching the top or a bottom subset of the array's elements. If the input is not located within the array, the algorithm will usually output a unique value indicating this. The algorithm is implemented recursively. Also, an interesting fact to to know about binary search implementation in Java is that Joshua Bloch, author of famous Effective Java book wrote the binary search in "java.util.Arrays". 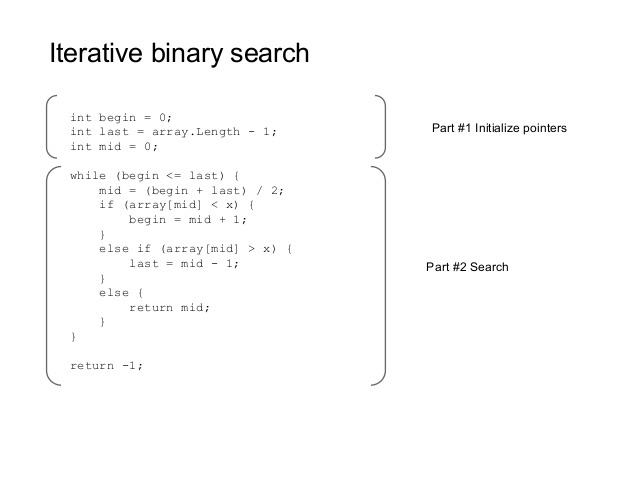 That's all about how to implement an iterative binary search in Java.